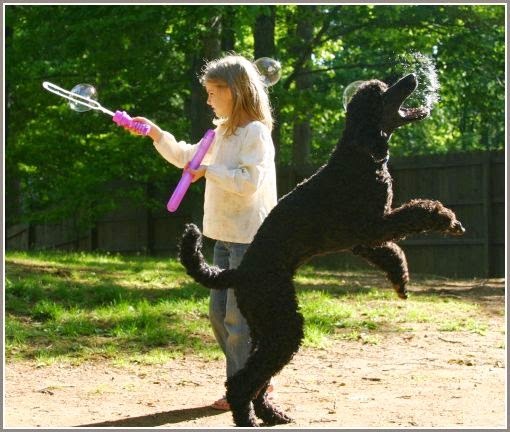 The Standard Poodle was originally bred in Germany as a duck retriever; he is still capable of performing that task today. 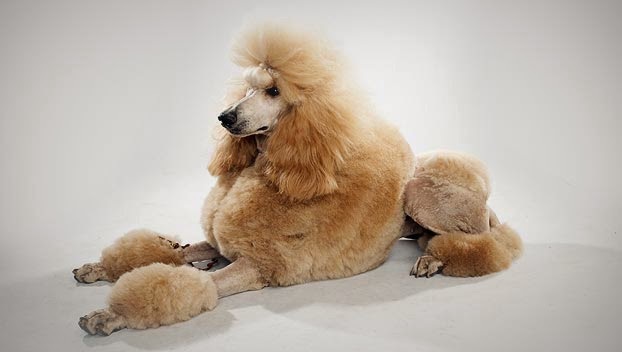 The crazy haircuts seen on today’s show Poodles have their roots in the dog’s hunting roots; the thick, curly coat was cut in a way that allowed him to swim but also kept his chest and joints warm. A Poodle’s intelligence can translate into stubbornness, so be kind but persistent with training. Other identifiers: Long body frame, straight tail or curving slightly upward, lean and long from head to toe. Possible alterations: Recognized in two other sizes, including miniature and toy. Poodles are thought to have originated in Germany, where they were called Pudel, meaning "splash in the water,” a reference to their work as water retrievers. The exaggerated show cut seen today began as a practical way to keep the dog’s joints and torso warm in cold water. 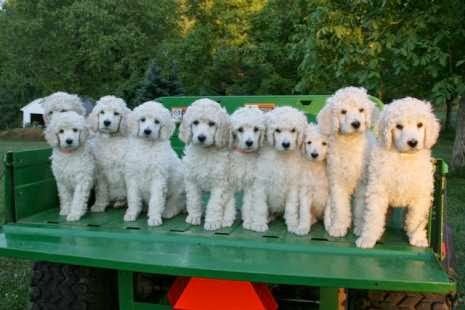 The Standard is the oldest of the three Poodle varieties. The Miniature and the Toy were created by selecting for smaller size. They, too, were working dogs. Miniatures are said to have sniffed out truffles, a type of edible mushroom that grows underground, and Toys and Miniatures were popular circus dogs because of their intelligence, love of performing, and ability to learn tricks. 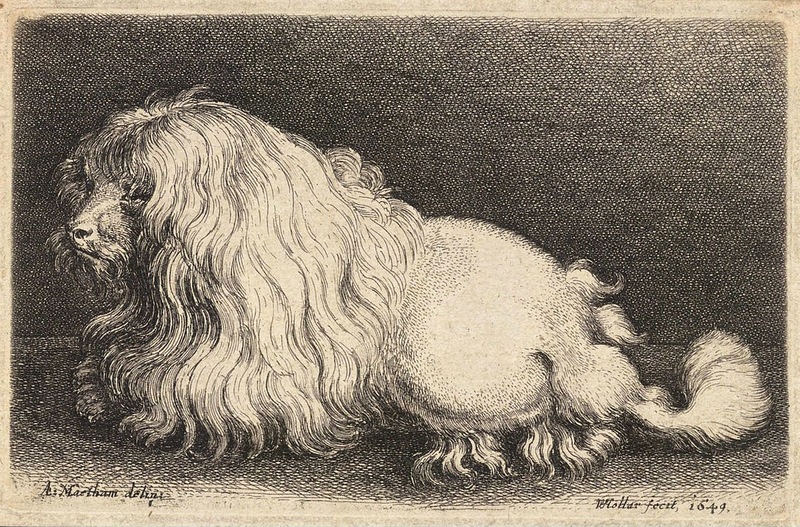 The curly-coated dogs became popular in England and Spain, but in France they were adored. King Louis XVI was besotted with Toy Poodles and the breed became thought of as France’s national dog. It was in France that the breed achieved status as companions, and Poodles still enjoy that status today. They are beloved around the world and are consistently ranked among the most popular breeds. Today the Miniature is the most popular of the three sizes, and the three varieties together are ranked ninth in popularity among the breeds registered by the American Kennel Club. Miniature: The Miniature Poodle has a lifespan of 13 to 15 years and may be prone to minor problems like trichiasis, entropion, distichiasis, cataract, glaucoma, lacrimal duct atresia and major concerns such as progressive retinal atrophy (PRA), epilepsy, Legg Perthes disease, and patellar luxation. Urinary stones are sometimes seen in this breed. Eye, knee, and hip tests are advised for Miniature Poodles, as are DNA tests, which can identify PRA and von Willebrand's Disease (vWD). Standard: This breed lives for 10 to 13 years, and may suffer from serious conditions like gastric torsion, Addison's disease, and sebaceous adenitis, as well as minor concerns like distichiasis, entropion, epilepsy, cataract, and canine hip dysplasia (CHD). Eye, hip, skin biopsy, and DNA tests are some of the tests which can be used to identify these conditions. Poodles require a lot of socialization and interaction with humans, as well as physical and mental exercise. 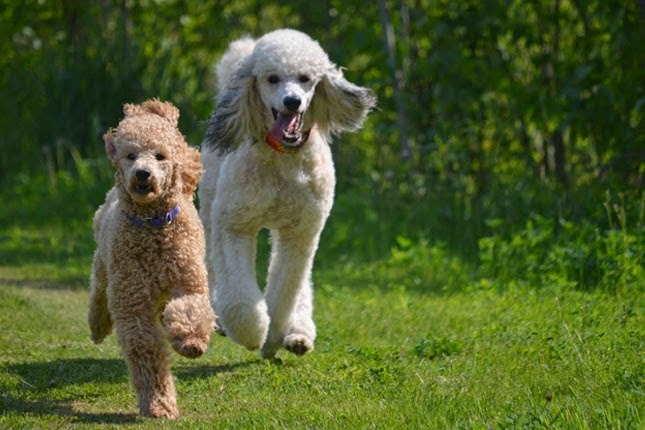 A short and challenging play or obedience session, in addition to a walk, is required everyday, although, poodles should not be allowed to live outdoors. 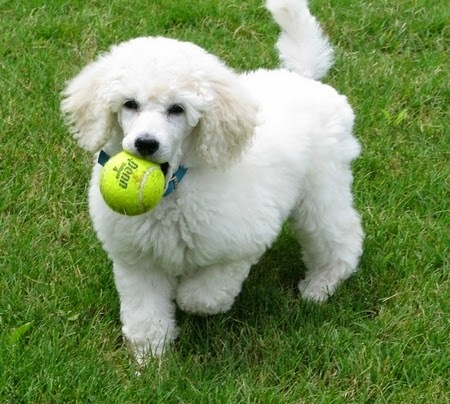 Standard Poodles require more physical activities (e.g., they love swimming). 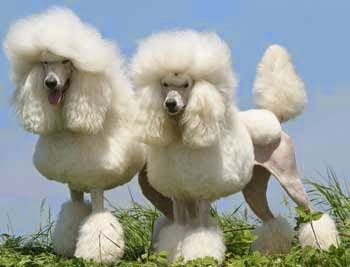 Show Poodles require daily hair brushing, however those with shorter coats need only a weekly brushing. During shedding, a poodle’s hair does not fall, but instead gets trapped in the adjoining hair, causing matting. Therefore, it should be removed at all costs. 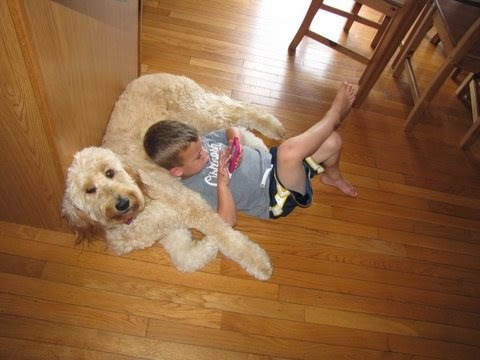 This can be done by taking the poodle for a pet clip (or haircut), which can be done once every four to six weeks. Grooming is a significant consideration in Poodles. The fine, curly coat that worked well when the Poodle spent his time in the water needs to be clipped regularly, typically about every 6 to 8 weeks, depending on his owner’s preferences. It mats easily and requires regular brushing at home, even with professional grooming. Left untrimmed, the coat will naturally curl into cords, though some people prefer that look. Dental care is important, particularly for Toy and Miniature Poodles. Keep on top of it by brushing teeth with a vet-approved pet toothpaste and having a veterinarian do regular dental checks. Poodles are bold, beautiful and brainy and owners must be ready to keep up with this breed's active and intellectual lifestyle. This breed can adapt well in most living environments as long as proper exercise is part of their daily routine. Poodles are typically groomed in one of three popular cuts: the continental clip, puppy clip and bikini clip. Depending on the cut you choose, frequent grooming is often necessary to protect their unique and high-maintenance coat. However, if you're sensitive to allergies and dander, the Poodle's hypoallergenic coat is worth the time-consuming and cost-intensive upkeep. 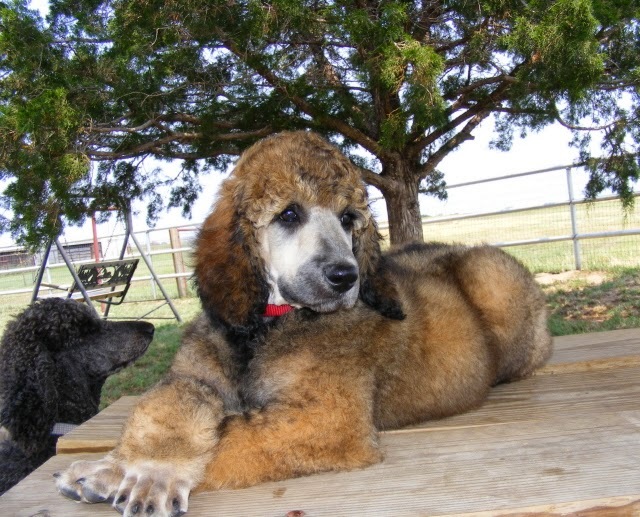 If the standard Poodle is larger than you'd like for your family needs, it's the only breed that can be seen in three size varieties: standard, miniature and toy. Boye, pet of Prince Rupert of the Rhine (1619–1682), was killed at the Battle of Marston Moor. Charley, pet of Nobel Prize-winning author John Steinbeck, a black (referred to as "blue" in the book) Standard Poodle, played Charley in the TV miniseries "Travels with Charley: In Search of America", based on Steinbeck's 1961 book of the same name. 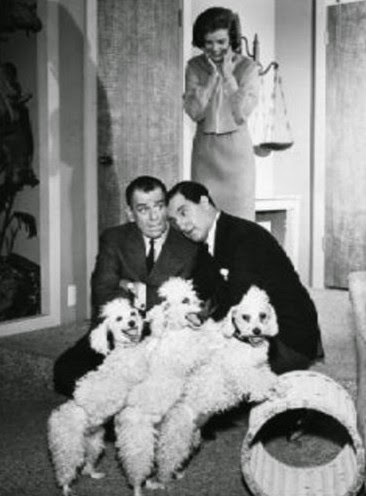 Rhapsody in White ("Butch"), the Standard Poodle featured in the movie "Best in Show". Roly was featured in the BBC's "EastEnders" for eight years. In Goethe's Faust, Mephistopheles first appears to Faust in the form of a black poodle. Darla the Poodle who plays Buffalo Bill's poodle Precious in The Silence of the Lambs (film). These curly-coated canines are often thought of as France’s national dog, though the breed originated in Germany. Using their brains and flexing those intellectual muscles is a must. Poodles love to work, and a day spent on the job as a therapy dog or assistance dog would be right up this breed's alley. Bred to excel in athletics as well as poise, Poodles love a day of training, learning new tricks and testing the brain's limits. A day spent swimming and fetching at the lake or pool would be the icing on a perfect-day cake.